The marriage certificate of William Herbert Puetz and Lena Klages. I hereby certify that William Buetz and Lena Klages were joined in Marriage by me, in accordance with the Laws of the State of New York, in the City of Brooklyn, this 30 day of January 1897. Recently, I decided to see if I could find any siblings of John Donahoe, son of Cornelius Donahoe and Mary Deasy/Dacey. John is the father of my husband's great-great-grandmother Mary Donahoe. Mary was born about 1873 in Marlborough, Middlesex County, Massachusetts, the daughter of John Donahoe and Eliza Field. John, her father, was born about 1840 in Ireland. By searching the Massachusetts vital records for Marlborough, between 1850 and 1880, I was able to identify a number of additional children of Cornelius and Mary. This entry will cover the oldest child I found of Cornelius and Mary Donahoe. While listening to the July 3rd podcast from The Genealogy Guys podcast, I got a great tip concerning census research. The creator of the Census Tools website (http://www.censustools.com) created a number of tools for extracting census data. These tools include Excel spreadsheet forms for a number of common research types including US censuses, US state censuses, international censuses, cemetery data, passenger manifests, family group sheets, research logs. In addition to the Excel spreadsheets, the website also has forms available in the pdf format. These images are copies of newspaper articles covering the automobile accident that killed Jesse Lent in August 1932. 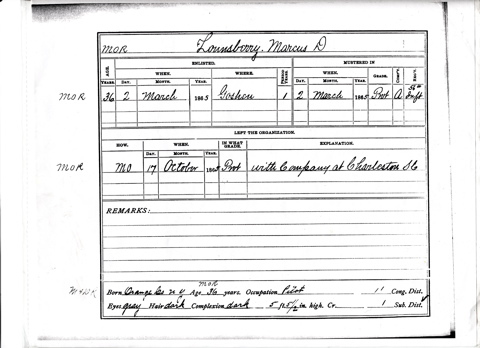 These are images of the Civil War service record of Marcus D Lonsberry. Much of my father's side of the family is very hard to research. A multitude of reasons exist for this state of affairs, but the main reasons are these: New York did not keep vital records until the 1880s and many of the family members were very poor. One of the most interesting brickwalls, though, is my great-great-grandfather, John W Rhodes, of Plattekill, Ulster County, New York. After finding my great-grandmother, Irene Rhodes, in the 1880 census, I traced her father, John W, through the census years. One pattern stood out to me, John always lived near or with Jonah and Abigail Rhodes. I assumed that these two might be his parents but I did not have proof of this relationship since before 1880 the federal census did not specify relationships between members of a household and he did not live with them in 1880. In a recent Genealogy Guys podcast, their guests, Gary and Diana Crisman Smith, mentioned keeping a website log of the sites you visit with notes so that you can remember where specific information came from and to identify sites to revisit at a future date. I definitely recommend the practice and, in fact, have started doing it myself using my del.icio.us account. For those of you who have not heard of del.icio.us before, it's a site that allows users to create an online bookmark of sites they visit. Since the bookmarks are online, they can be accessed from any computer connected to the Internet. In addition to the url, a user can keep add a site title, notes about the site, and give the site tags, or keywords, which can be used to group sites together. For instance, you may want to tag all genealogy related sites with the keyword genealogy and then all family name sites with the family name as a keyword. The site will also automatically add the date on which you added the site to your bookmarks.